Pleasure without compromise. 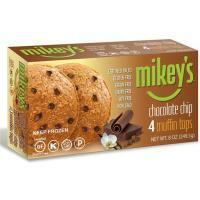 That's what you get with Mikey’s Chocolate Chip Muffin Tops. They're a super- indulgent treat made with simple ingredients found in home pantries. And they're packed with all the nutrition healthful benefits you expect from Mikey’s: certified Paleo and certified gluten-free + grain, dairy, soy, peanut & GMO-free.